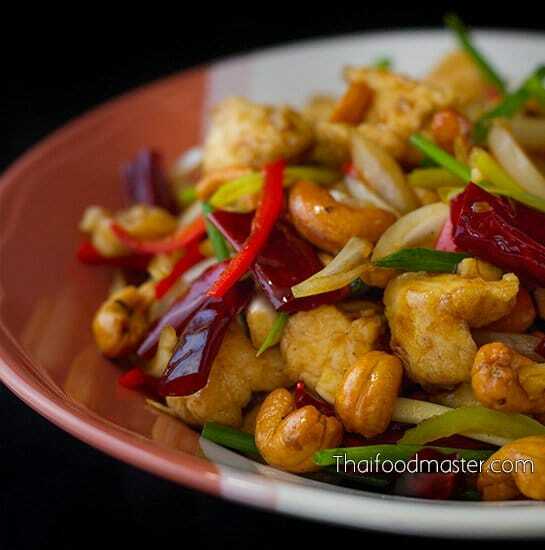 Check out your local Asian markets for other types of salted fish, they all work well for this simple to prepare dish, you may need to adjust the seasoning according to the saltiness of the fish you find. 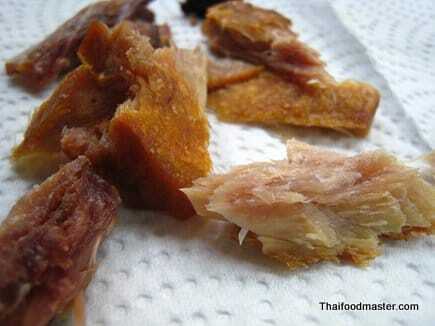 Soak salted queenfish in water for 20 minutes to remove excess saltiness. 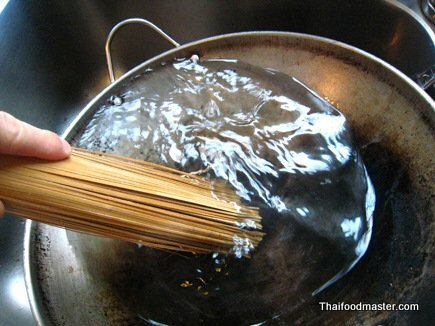 Dry it well with a paper towel. 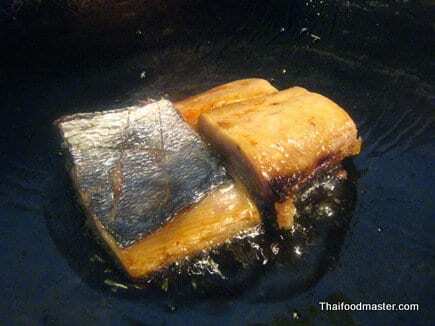 On a medium low heat, fry the salted fish from both sides, until golden. 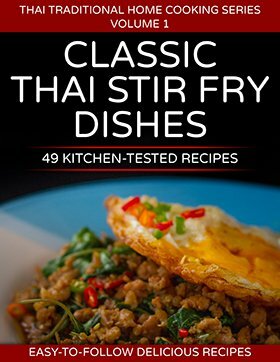 The picture shows a larger batch than needed in this recipe. 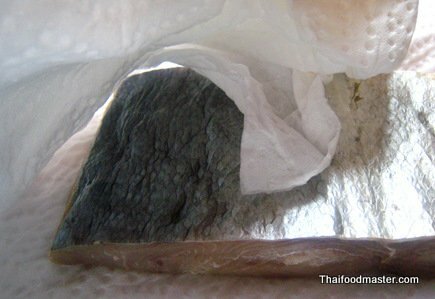 It keeps well sealed refrigerated for few days. 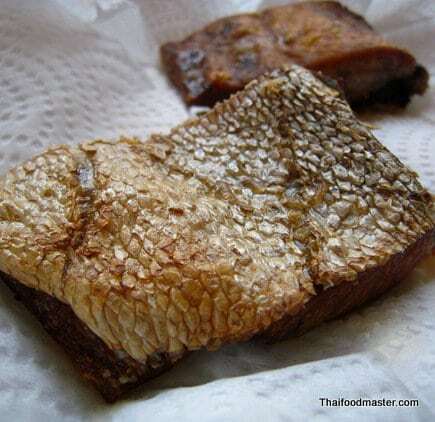 With your fingers, break the fish meat into small bite size pieces. 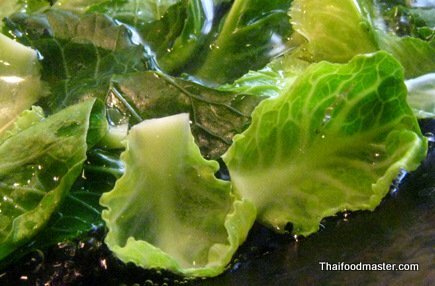 Blanch the Brussels sprout in hot boiling water briefly with a tablespoon of salt, transfer immediately to an ice bath. 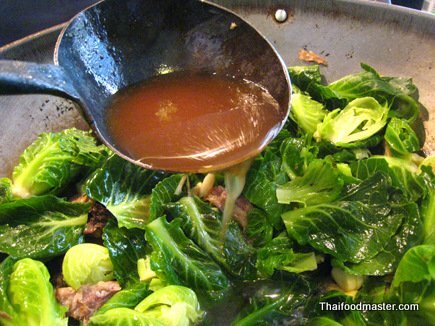 Blanching helps to keep the brussels sprout crisp, tender and improve their color. 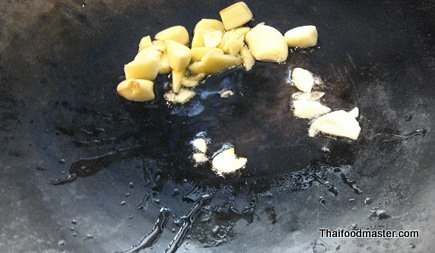 In an iron cast wok, on a medium high heat, fry garlic until fragrant. 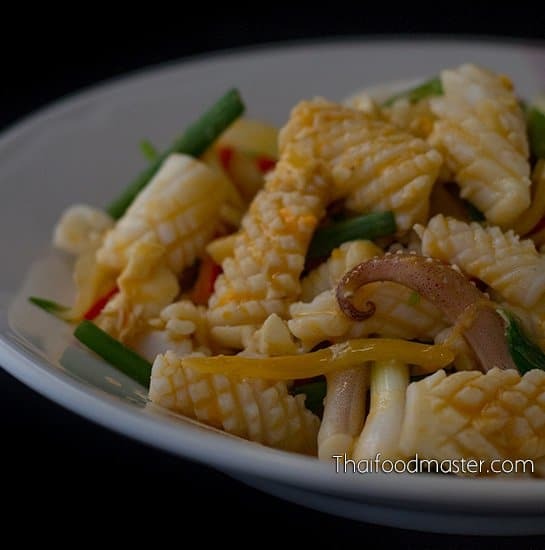 Add salted fish and fry for few seconds. 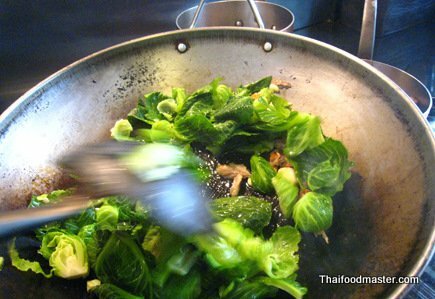 Add brussels sprout and keep stir-frying for a minutes or so until the vegetables looks crispy. 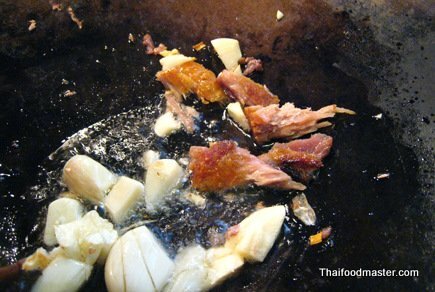 Add seasoning and fry for last 20-30 seconds. 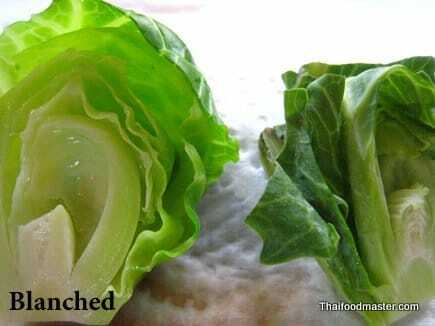 This looks so easy to make! 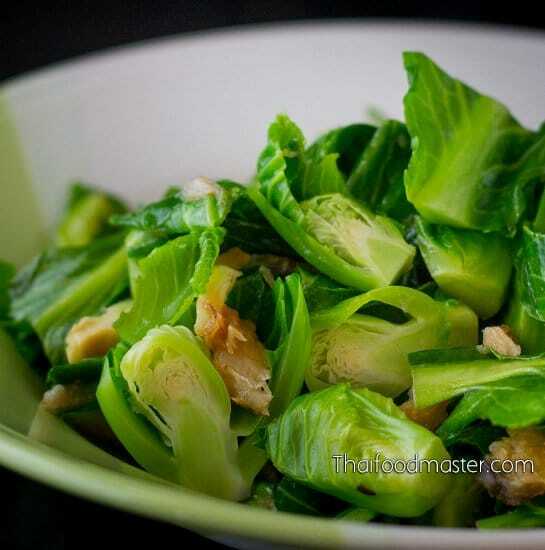 I love the greens there! Thanks for sharing. 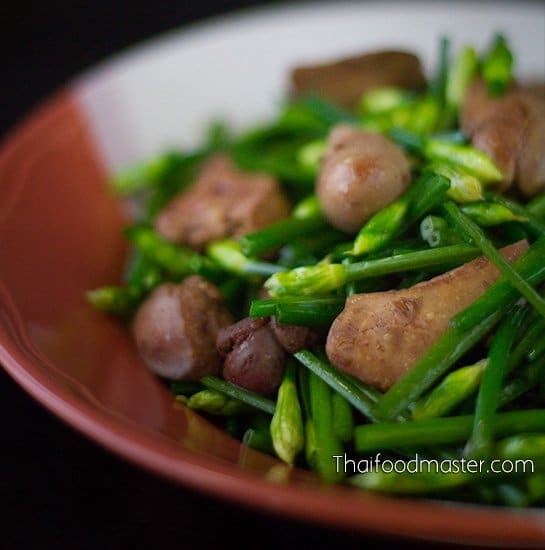 ผมดูคุณมาจากรายการ ที่ชื่อ “ฉันรักเมืองไทย” ผมคิดว่าคุณจะเป็นต้นแบบให้คนไทยๆหลายคนรักประเทศไทยมากขึ้น คุณเท่มาก! 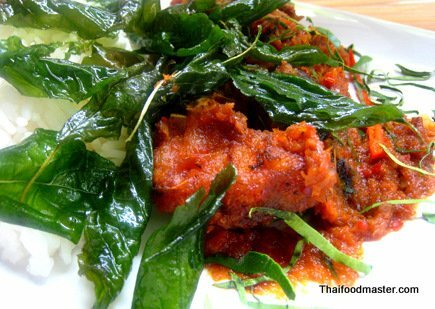 I’m ashamed that though I’m Thai but I can’t prepare Thai food as good as you. I do admired this web site. 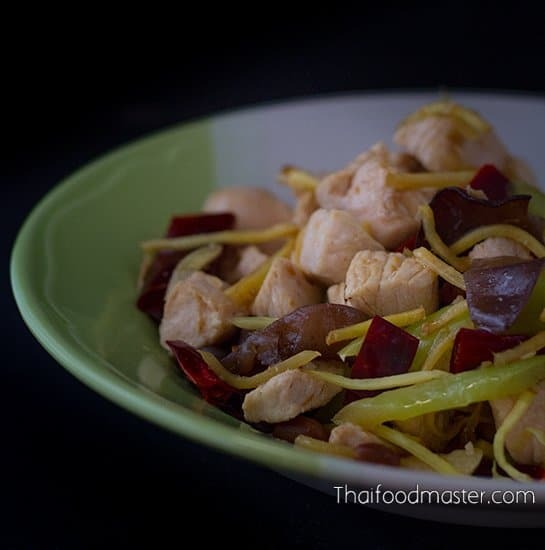 You know how to choose and prepare the ingredients very well (much more better than me he he he) Thank you very much for your kind thought in trying to promote Thai food around the world! 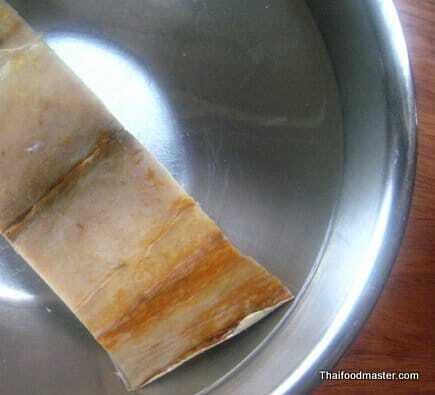 You are more Thai than many Thais.